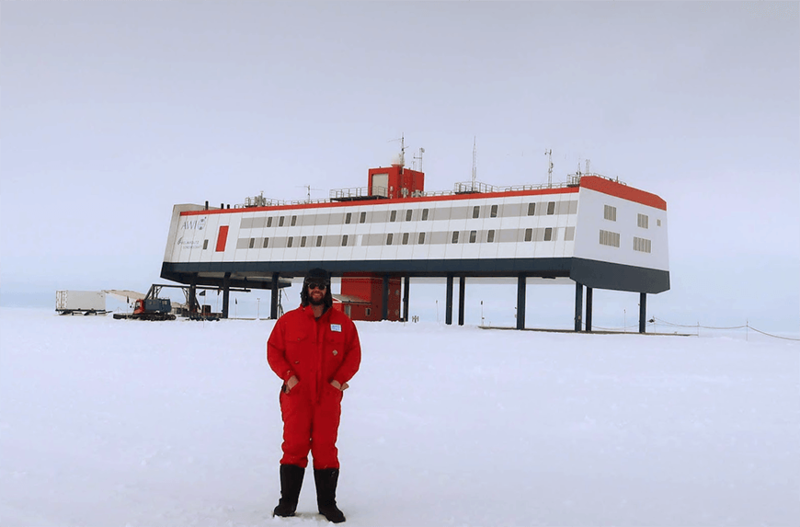 Scripps Oceanography physical oceanography student Paul Chamberlain stands in front of German Antarctic base Neumayer in this photo he recently posted on the blog documenting the Southern Ocean Carbon and Climate Observations and Modeling (SOCCOM) cruise he's participating in. Chamberlain, who works in the lab of Prof. Lynne Talley, has been aboard German icebreaker R/V Polarstern since mid-December for a 55-day cruise into the Southern Ocean. Much of his time involved deploying a series of autonomous Argo floats and taking regular conductivity, temperature and density measurements, but the cruise included a stop in mid-January to unload and deliver supplies for Neumayer, which gave Chamberlain and others from the ship the chance to leave the icy ocean for the icy land. This week the vessel was heading back north along the Antarctic Peninsula. "The pace of our operations has increased as we made our way up the slope to the peninsula. We are conducting round the clock CTDs and mooring operations," Chamberlain posted. "This is a sprint to the finish; it is hard to imagine that in a little over a week's time this expedition will be over. I honestly have mixed feelings about leaving: I am obviously very excited to get home to friends and family, but this trip has been such a unique and amazing experience. I hope to be able to take some time on deck over to soak up the last of Antarctica."